Luxury rents are dropping across the city. Mixed real estate in Williamsburg, Brooklyn. Luxury listings are becoming so common in New York City that more high-end apartments are offering renters incentives to move in. And now a new reporthas found that luxury prices are "dropping across the board." RentHop, looking at200,000 monthly listings from Q4-2016, found that while luxury listings are dropping citywide, "non-luxury rents seem to indicate an exodus from lower and mid-Manhattan as well as the more expensive parts of Brooklyn." The report defined “luxury” as buildings that featurea doorman and / or a fitness center and thatare generally high-rises. A map from RentHop shows thatrent for luxury one-bedrooms fell in 24 neighborhoods across the city, with only 11 areas showing increases. 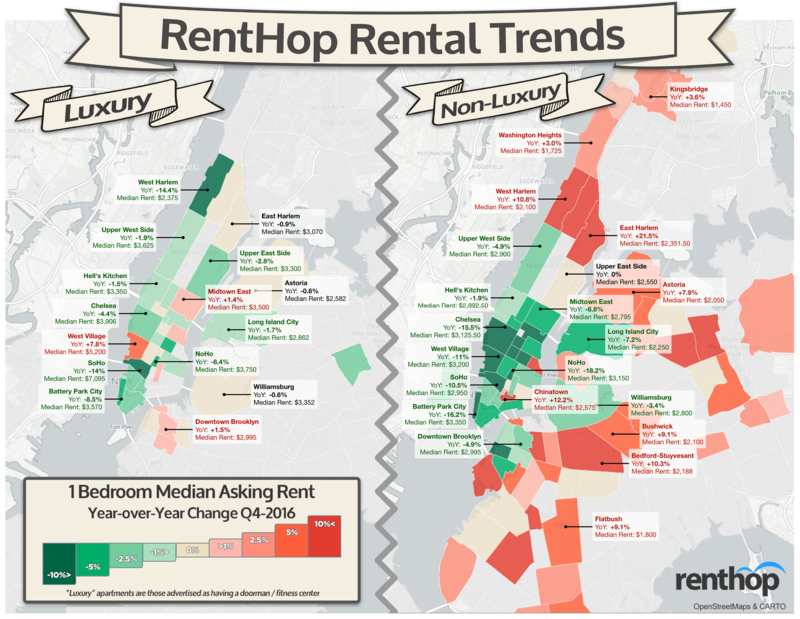 The real estate site also compared luxury and non-luxury rents for neighborhoods across NYC duringQ4-2016, so renters could see what they can afford, finding that some may be "just $200-300 per month away from having a doorman."